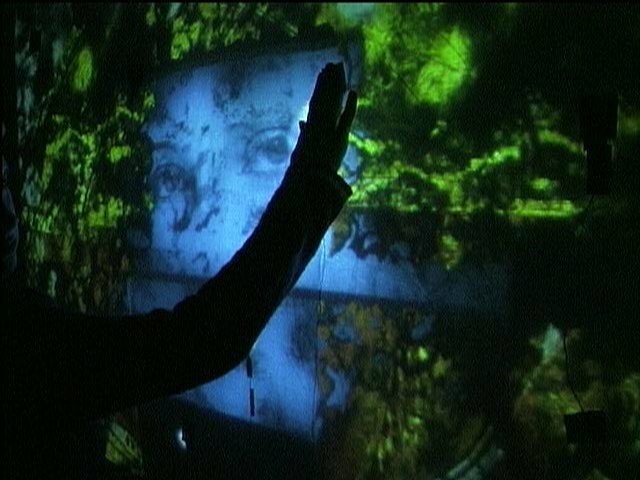 Subterranean Cosmology is an interactive video installation exploring themes of memory, longing, and tactility in the digital image. The interface for the piece is a rear-screen projection with embedded touch sensors, creating activation points within the image field. Each sensor responds to pressure, producing different responses to a push them from a light touch. The viewer explores the surface of the projected image, bringing to life fragments of images, texts, and sounds, all woven in an interconnected network of associations that creates a thread through eighteen scenes or vignettes. This is a labyrinth without a single correct path, without a beginning or end. Rather than a linear process of exploration, discovery, or revelation, the experience is created through the accumulation of associations and through the physical tactility and sensuousness of the interface itself.